An ambitious anatomist. An associate dean with a secret agenda. One wrong step could mean the end of everything Sarah has worked so hard to achieve. Dr. Sarah Whitley has been hired as one of the founding professors at the new Carlton College of Medicine in San Francisco. She sees the opportunity to prepare a series of instructional cadaver dissection videos and a one-of-a-kind exhibit of plastinated human anatomy specimens as her chance of establishing her reputation as an expert anatomist and foremost educator. But the Associate Dean of Basic Sciences, Dr. Sidney Toffer, has other ideas. Man Exposed gives the reader a unique glimpse into the dark and devious soul of a total narcissist, and how far they’ll go to be the center of attention. If you like captivating characters, unpredictable twists, and psychological suspense, then you’ll love L.L. Spriggs’ riveting tale of corruption and intrigue. 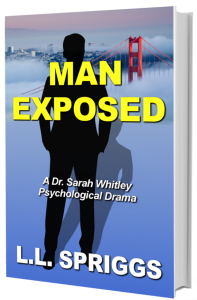 Buy Man Exposed today to find out how Sarah resolves her precarious situation.